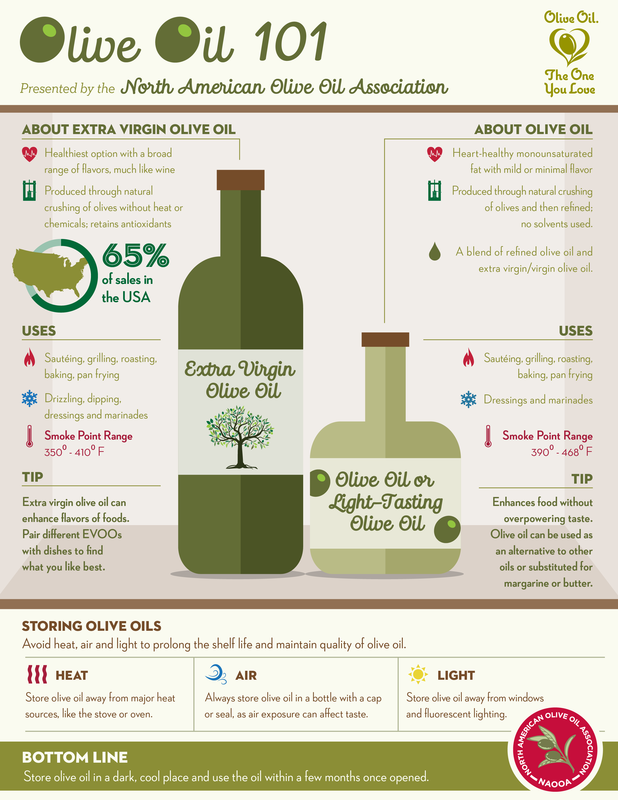 Here's a visual guide to buying, storing and purchasing olive oil. Produced through natural crushing of olives and then refined; no solvents used. A blend of refined olive oil and extra virgin/virgin olive oil. Extra virgin olive oil can enhance flavors of foods. Pair different EVOOs with dishes to find what you like best. Enhances food without overpowering taste. Olive oil can be used as an alternative to other oils or substituted for margarine or butter. Avoid heat, air and light to prolong the shelf life and maintain quality of olive oil. Store olive oil away from major heat sources, like the stove or oven. Always store olive oil in a bottle with a cap or seal, as air exposure can affect taste. Store olive oil away from windows and fluorescent lighting. Store olive oil in a dark, cool place and use the oil within a few months once opened.